Well, not just plain, raw, tart cranberries--they, of course, must be swirled, twirled, and coated in some sort of buttery and sugary goodness! 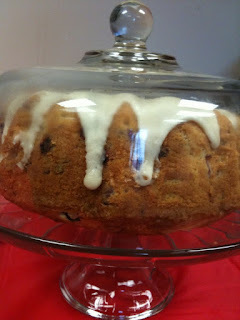 And, of course, I would never just make a buttery, sugary, cranberry treat without an excuse to share it! Thank goodness for MOPS! These are the cakes that have made an appearance at the last two MOPS...where amazing food has been in an abundance! In a large bowl, cream butter and sugar until light and fluffy, about 5 minutes. Add eggs, one at a time, beating well after each addition. Stir in vanilla and orange peel. Combine flour, baking powder and salt; add to creamed mixture alternately with sour cream. Fold in cranberries.Pour into a greased and floured 10-in. fluted tube pan. Arrange a rack in the center of the oven and preheat to 350F. Use 2 Tablespoons of the butter to generously grease an 8-inch round cake pan. Set aside. Add 1/2 cup of the sugar and the cinnamon and allspice to a small bowl. Pour mixture into the bottom of the prepared pan. Tilt and swirl the sugar around until it evenly coats the bottom -but not the sides- of the pan. Arrange cranberries in a single layer on top. In the bowl of a stand mixer (or using an electric hand-held mixer) cream the remaining 6 tablespoons butter and 1/2 cup sugar until light and fluffy. Add the egg and beat until well combined. Add the vanilla and mix in well. In a separate bowl, whisk together the flour, baking powder, and salt. Start your mixer on low speed and carefully add 1/3 of the flour mixture followed by 1/3 of the milk. Repeat, scraping down the bowl occasionally, until you have added all the flour and milk. Spoon batter on top of the cranberries in the pan. Smooth the top bringing the cake batter to the edges of the pan. Bake for 30-35 minutes--until a toothpick comes out clean from the center. Let cake cool on a wire rack for 20 minutes. Turn out on a cake platter. Look who showed up for MOPS! OPRAH'S 12 DAYS OF CHRISTMAS BIG GIVE! Baby J was all smiles and giggles! I guess Katie misunderstood who I was trying to get to smile! Thanks for those recipes. I didn't get to try the 2nd one, but I very well remember the first one and it was the most amazing thing ever. Now seeing the recipe, I can see why! :) SO worth it!!! im so glad you got a good pic of Oprah! i kept trying while she was talking but she was moving too fast for me! great recipes and pics! That was an awesome MOPS! The cake I tried was scrumptious and Oprah was looking fab!